I've been getting back into the swing of hand dyeing fabrics regularly. It's one of my greatest joys to play with colour and try and decipher the language of dyes to get beautiful results every time. There's only one problem with that - not enough cupboard space! Now that I don't have a gallery and shop to sell my hand dyed fabrics through, they are beginning to pile up and spill over. I'd dearly love to keep them all, but seeing as I couldn't possibly use them all in my lifetime, it's time to part with some. These fabrics are high-quality 100% cotton broadcloth, width 114cm. I use this as it's a little bit more tightly woven than quilting cottons, but not so tight that it's difficult to stitch through, and it has a beautifully smooth finish. 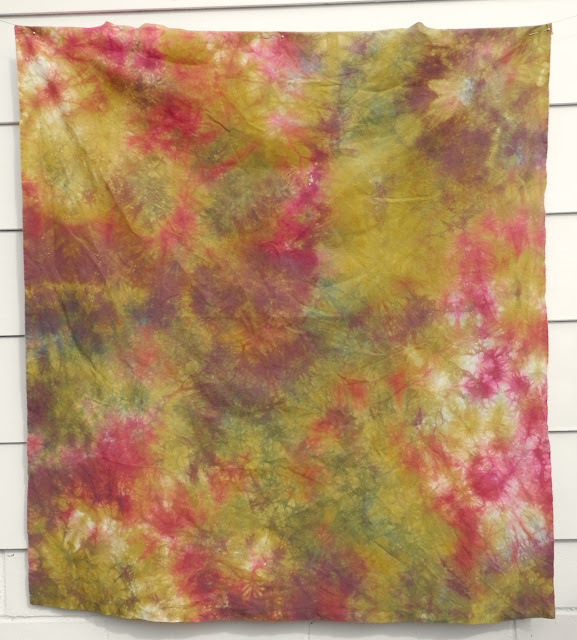 The dyes I use are commercial grade fibre reactive procion mx dyes. They have great fade-resistant qualities as they form a chemical bond with cellulose fibres (but never store your fabrics in direct light). So, on to the fabrics, they are all more or less one metre wide except this first one. 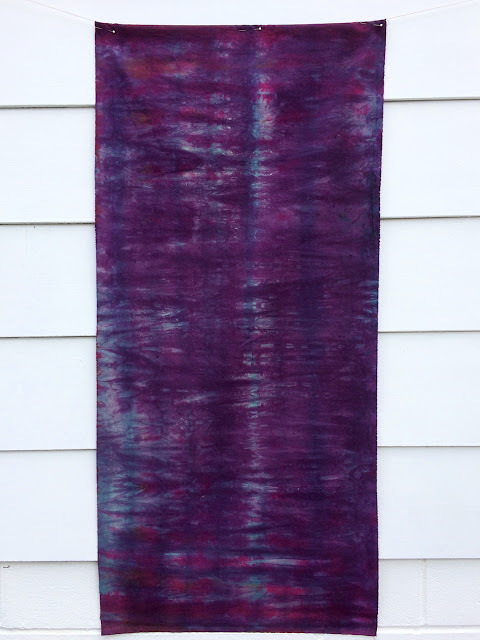 Fabric A - half metre dark purple ripple pattern. This has some fuchsia touches at the top and bottom edges and a base colour of turquoise and darker blue vertical stripes peeking through. $NZD14 plus postage. 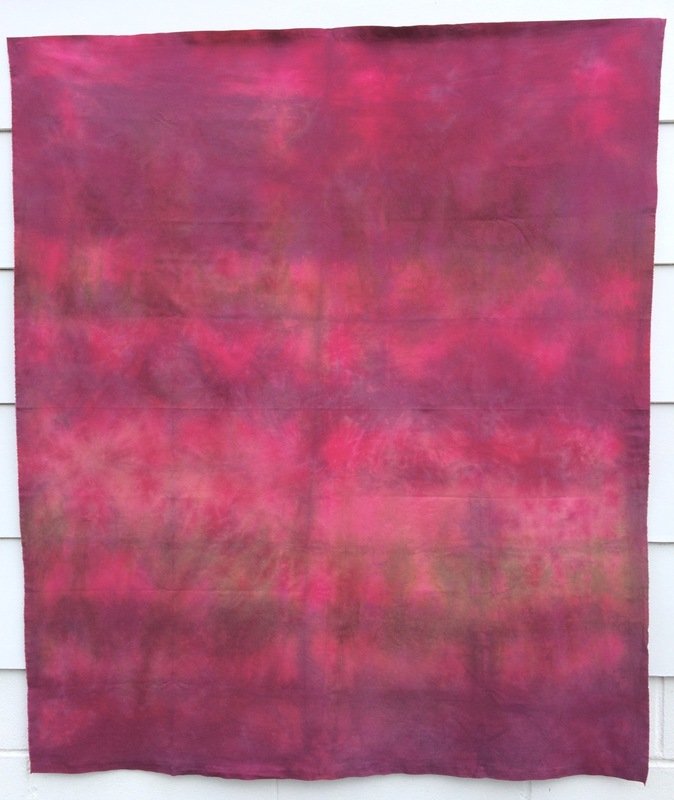 Fabric B - The photo doesn't give the richness of this fuchsia over-dye justice. It's hard to photograph colours 100% accurate, I've done my best to get them looking right on my computer screen, but remember that different computer monitors may show them a little different. $NZD28 plus postage. 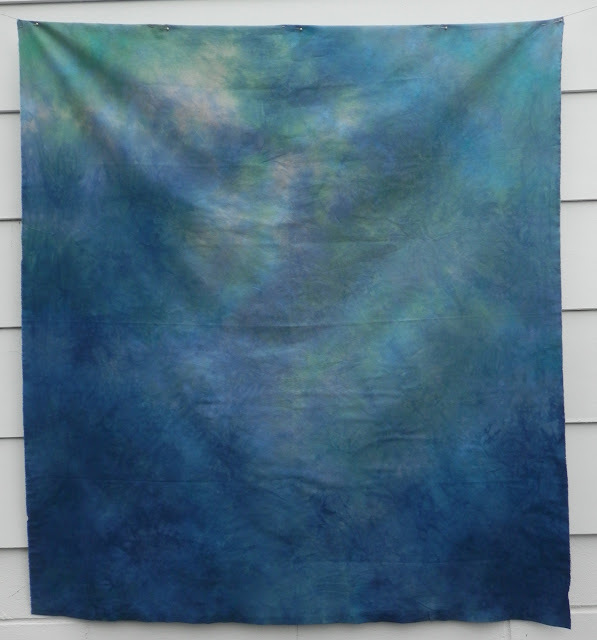 Fabric C - This one is an interesting rippled pattern that I made as a base fabric for an underwater quilt. I made several though, and this one didn't get used. It has turquoise sections interspersed with some muddier green and brown sections $NZD28 plus postage. 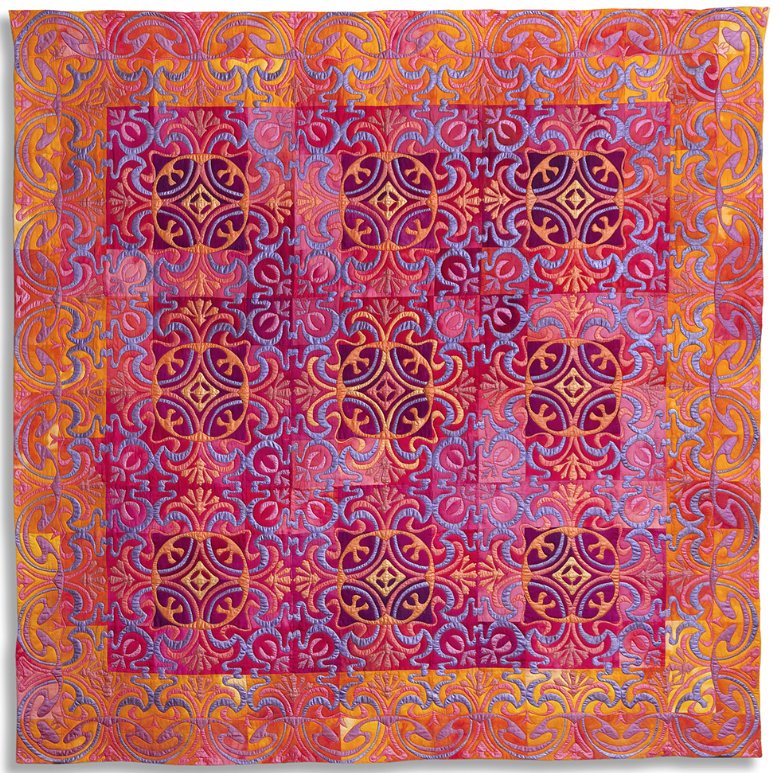 Fabric D - SORRY SOLD - my favourite! It reminds me of a Monet waterlily painting. Aqua and turquoise with touches of pink deepening to navy blue towards the bottom edge. $NZD28 plus postage. 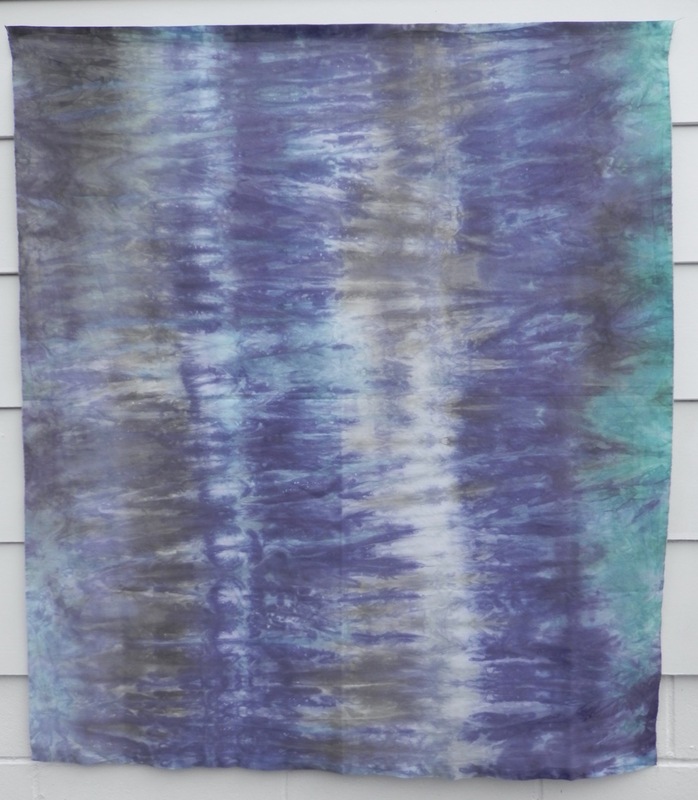 Fabric E - SORRY SOLD - One of my water ripples and reflection pieces. Greys, purple/blue and a touch of aqua. This has some beautiful shapes and colour changes through it. $NZD28 plus postage. 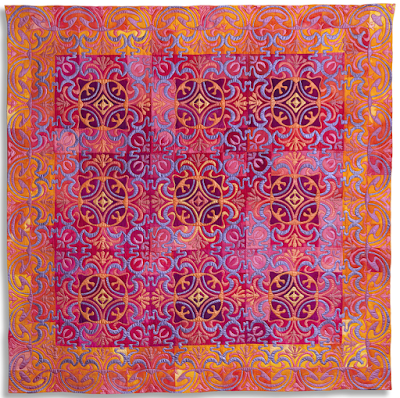 Fabric F - highly patterned with lots of interest through it, this piece was dyed chartreuse but crammed between fuchsia and burgundy pieces resulting in some really appealing crease patterns and a sprinkling of white highlights. 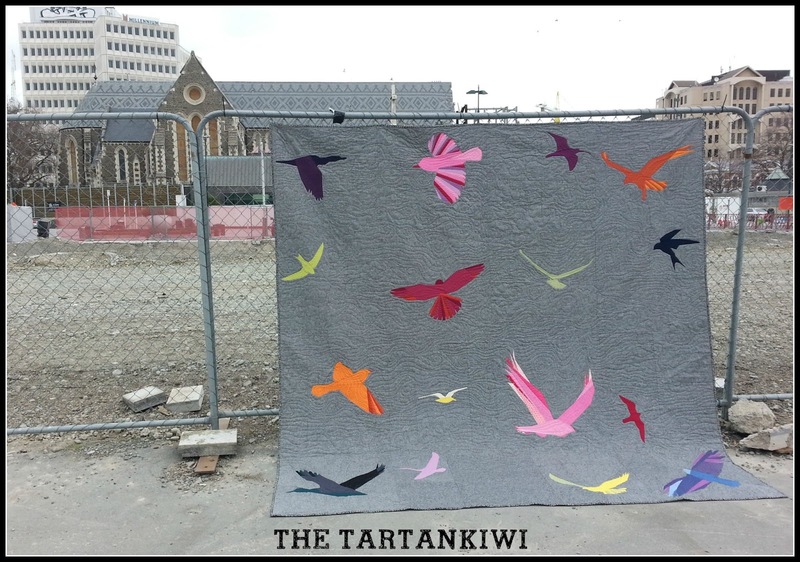 $NZD28 plus postage. That's enough for now. I might put up some smaller pieces soon, perhaps some fat-quarter bundles? Let me know if there are any specific colours you are interested in. Overseas postage needs to be quoted individually so please email me for a rate. An inventory is a complete list of items - such as all the wonderful, beautiful quilts you have made. I started to keep one over a year ago when my SAQA mentor, Lisa Call, suggested I do so. We all know documentation is a good idea and that we should probably get around to it one day, but I felt it was too big. I had no idea where to start. But, wanting to be a good mentee, I took the plunge, wrote up a very basic form and started filling it in. Every time I refer to it, I'm so glad I did. 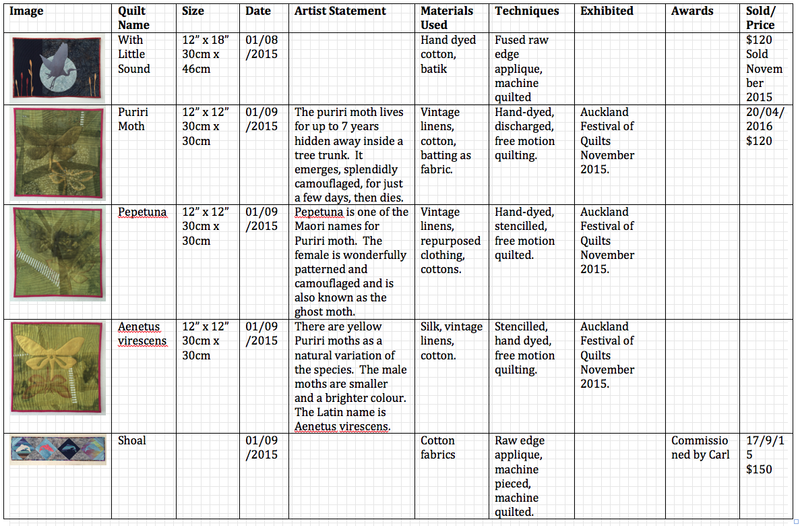 What information should a quilt inventory have? Mine is pretty basic. I include an image, the name, size, date completed, artist statement, materials used, techniques, where it's been exhibited, awards won, date sold and price. I know other artists whose inventories are a lot more detailed, but at the very least an inventory should have an image, name, size and date completed. There is plenty of software and apps around to keep inventories but I just made a table in a Word document. I can add an extra row whenever I finish another quilt. An Excel spreadsheet would work just as well, and I can't think now why I didn't use one, it would be handy to be able add more columns easily. What do I use my inventory for? First off, it makes it really easy to check sizes without having to unroll a quilt and measure it (after finding the right quilt in amongst all the rolls and wrappings first!). 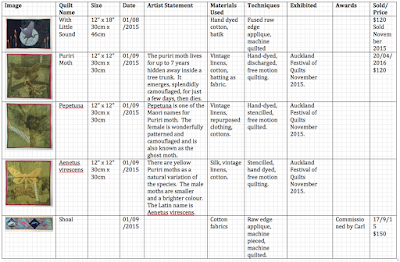 It also helps me remember at a glance what quilts I have available if I'm considering entering a show or exhibition. My inventory helps me know how many quilts I've made in a year, or what date I made a particular one. The artist statement helps remind me what I was trying to achieve when making a particular piece and listing the techniques and materials reminds me of how I made it. I always think I'll remember, but time wears away those little details. I can use it to feel good about my productivity if I'm feeling a bit slow - it's nice to look back and celebrate what I've done. And occasionally I glance through it to remind myself of what I wanted to try next. Seeing all the images together helps me remember what problem I wanted to solve. Are you overwhelmed at the thought of trawling through all your quilts to add to an inventory? Then don't! 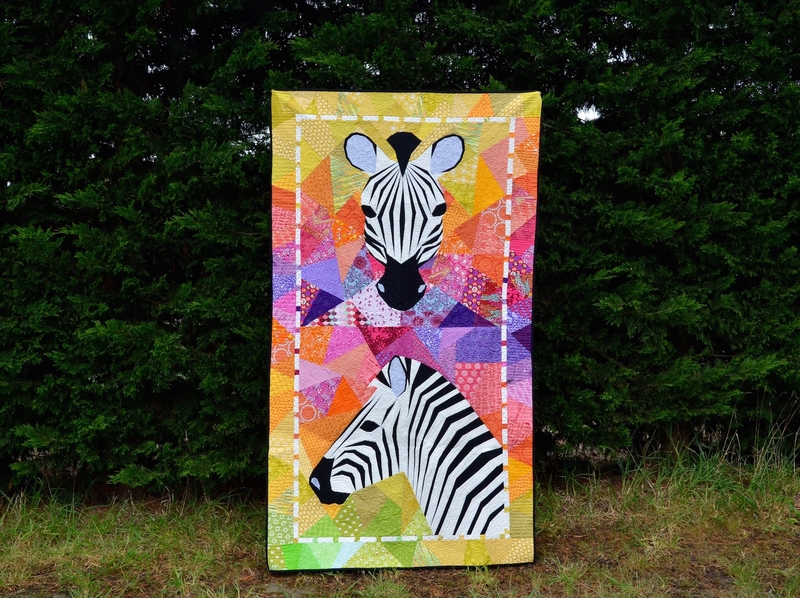 Just start with the quilt you finished last and make a pledge to add every quilt you make from now on. Easy and no stress and it will get you in the habit. Then, every now and then when you are unrolling quilts for some other reason, measure a couple of older ones up and add them to your inventory. Grow it by little steps. An inventory is such a valuable tool, even if you think you'll never enter shows or make enough work to worry about such a thing. I wish I had started mine at the very beginning of my quilt making career. So start one today, and, if you already keep one, tell me how you work yours, I'd love to learn from you. Lisa and I have a great chat about all the interesting and exciting things she fits into her life. 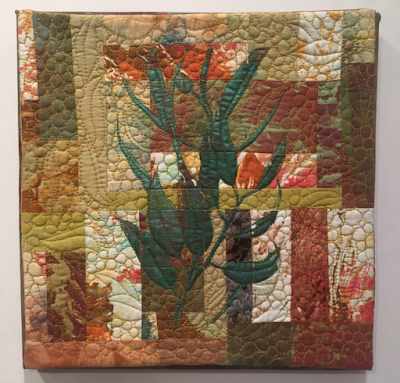 I would love to book into one of the textile tours she runs - Tokyo Quilt Festival in January 2018 sounds just my thing! 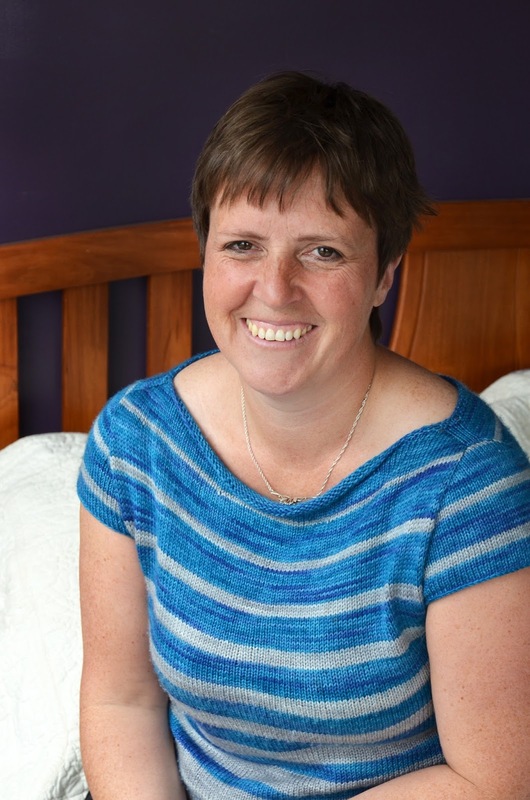 We also talk about the realities of being a travelling textile teacher, redefining yourself as an artist and giving yourself permission to play. 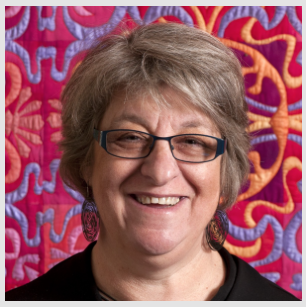 Lisa will be running four classes at the National Quilt Symposium in October this year. 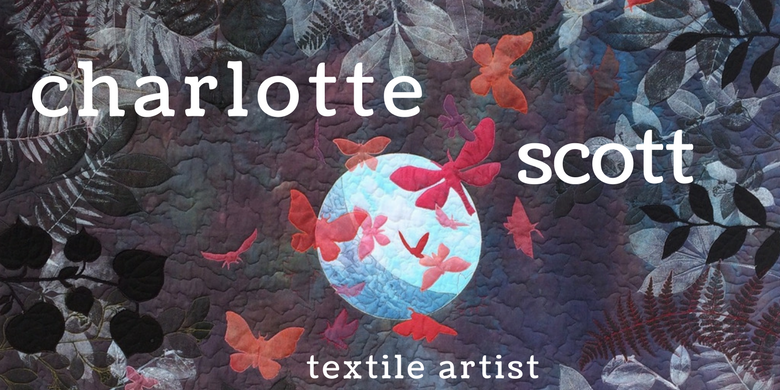 Cityscapes, Opulent Overlays, Creative Beading and Indigo, Shibori and Beyond. They are all popular classes that Lisa's students always come away inspired and keen to try more. At times during the podcast you'll hear the rain in the background. That was the beginning of Cyclone Cook that came through New Zealand during the week. Luckily Northland missed out on most of it, further down the island people weren't so lucky. I could have chatted to Lisa for another half an hour at least. She's an amazing person who fits so much into life. I hope you enjoy our interview. If you are interested in sponsoring an episode of the podcast, please get in touch. 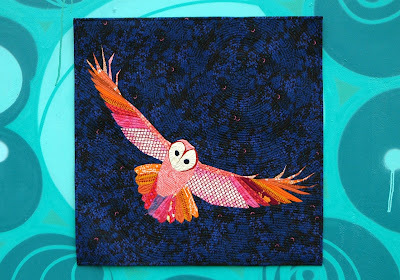 That is a wonderful story for your sweet dusky quilt. I'm intrigued with the layering ideas and would like to learn more. Can you point me? Well Miss Jean, I did point you in the direction of the process post I wrote recently about making my Early Morning Fishing quilt. But I thought I'd give you a couple of photos here of another quilt. It's still in process, but the first photo shows you pretty much the final layout. It's not completely cropped, but I left the white background fabric sticking out of the side there so you can see the plant printing on it. 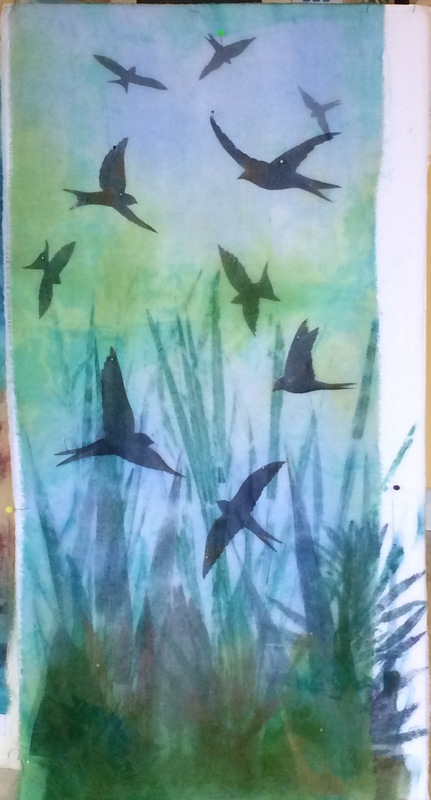 There is a whole piece of hand dyed silk organza laid over the entire background and the swallows, also made of silk organza, are placed either under or on top of that overlay depending on how far away I want them to appear. But I really wanted to show you what's going on at the bottom of the quilt. If you click on the photo I'm pretty sure you'll see it bigger. I've folded the piece of organza overlaying the background up and out of the way. You can see the plant printing on white fabric and then lots of different bits and pieces of silk organza arranged over that. 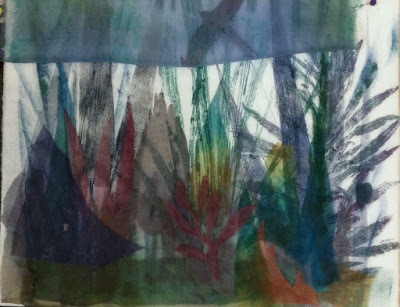 When the organza overlay is put back, the colours mute down a bit and the shapes get a little more indistinct, but they add complexity and interest. This is what I talk about when I say I'm layering up silk organza. 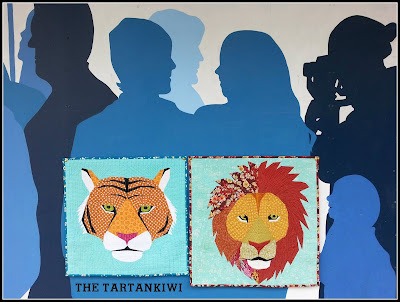 There is either Mistyfuse (a fusible web) on the back of the shapes, or I use a bit of BoNash fusible granules under the top overlay to hold everything in place (shout out to Tulis Textiles online here in NZ where you can get both those products). I hope this helps, Miss Jean! This is a bit different from my usual posts, it's written for a different audience, but I thought I'd share it with you too. I’m putting the finishing touches to my latest quilt. Doing the binding, thinking up a name, stitching a label. These are the bits that you know you have to do, and you’re glad you’ve done them when they’re done, but getting around to doing them? Well, it’s a bit of a drag. I think it’s because I get so excited about the making of a new quilt that the finishing bit makes me sad that that excitement is over. 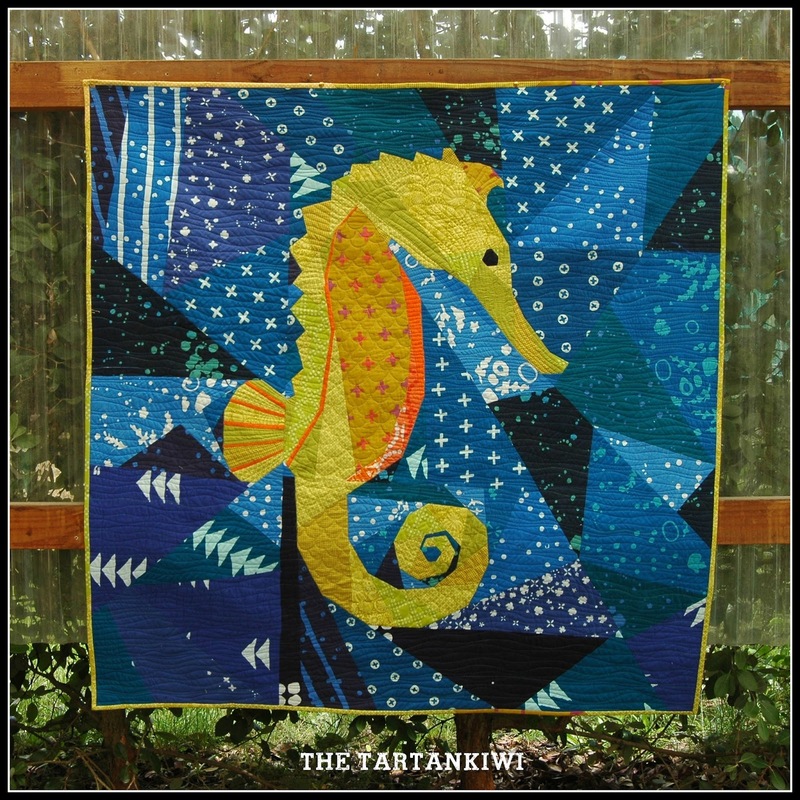 I mostly make quilts designed to be hung on the wall rather than used on a bed. 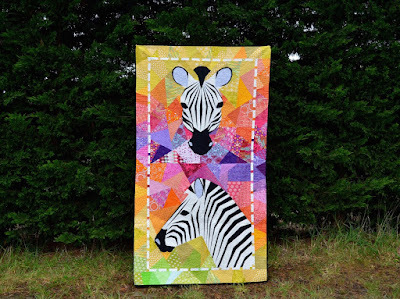 People call them art quilts, but either way, they’re still quilts. 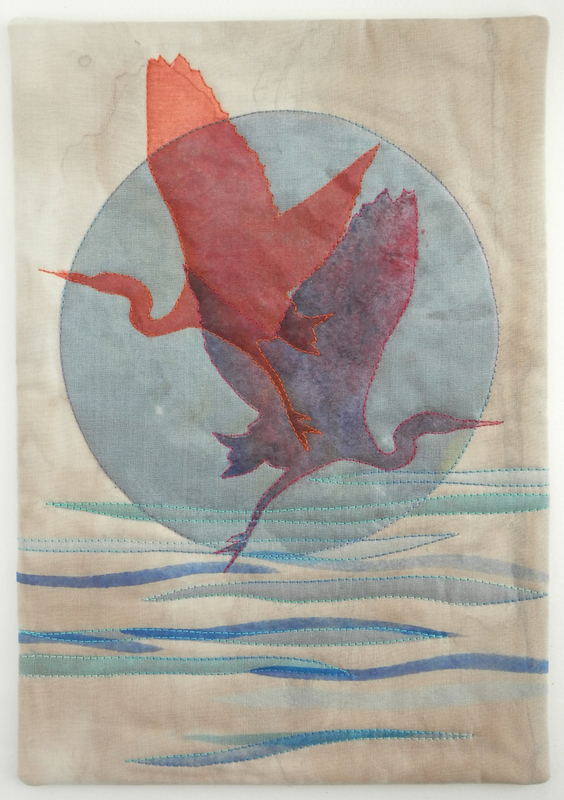 Three layers, quilted together with stitches, made with fabric and telling a story. This particular one started with paint. I’d always wanted to try printing with plant material, so one day I just did. I picked a branch from a weedy bush outside, rolled some textile paint on it, laid it down on white fabric and pressed it down. It made such a fabulous print that I literally clapped my hands with glee! Such a great beginning. I’m always trying to get a sense of light into my quilts. It’s harder than it looks and I’ve had many pieces that turn out flat. But since I’ve started using translucent silk organza, layered up to get depth, I’m getting better results. So once my flora prints were dry and heat set, I used layers of silk organza over them to build up an image, to discover what the quilt wanted to tell me. 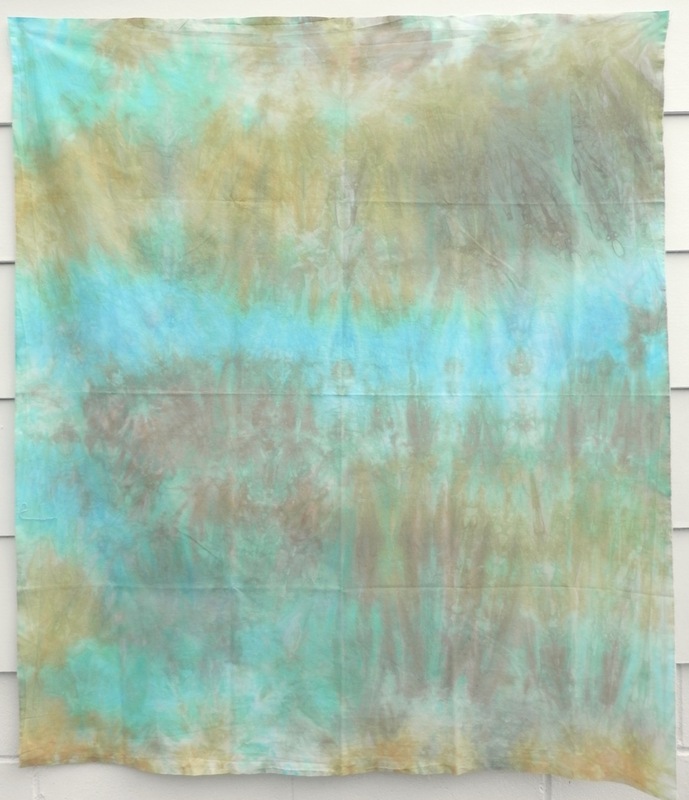 Playing with silk organza is like playing with fabric and playing with paint at the same time. I’m trying to learn the theory behind how layering the different colours influences the final overall colour, but it doesn’t seem to follow many rules. You’d think that yellow organza plus blue organza equals green, but it’s not always so. I hand dye my organza so the subtle changes across one piece alter the final result, as does which order you put down the fabrics, how deep the colour is on each piece, what base fabric you are putting them down on and so on and so on. It's an endless process of experimentation, auditioning and decision making that delights the creative part of my soul. I cut out some moths and a silk moon to use as focal points for what had turned out to be a dreamy, dusk-like background. Was that my subconscious talking? Dusk and dawn are my favourite times of day - beginnings and endings, and always such perfect light. Then it was on to the final big step. The free-motion quilting is a meditative process that transforms the flat plane of a quilt to a wonderfully textured surface. It’s like we get another chance, another opportunity to add a layer to the story that is the quilt. And now it’d ended, the quilt is made, the story wound up. I’m a little sad, but I know another quilt, another story, will start again soon.